In a previous blog I wrote about the phoney support calls many of us have received and I’d now like to warn you about some other scams. The first one involves a fake system message that pops up on your screen stating your computer is experiencing difficulties. 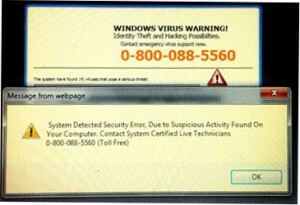 One of my customers allowed me to take a photo of her screen showing the bogus alert in order to help more people become aware of the scam. The message looks genuine doesn’t it? Couple that with a slow running computer, something we’ve all experienced and it’s very believable. In addition the number to call is free so what have you got to lose? Well actually quite a lot. The ‘support technician’ you get through to answers your call promptly (that would immediately raise my suspicions) is very sympathetic and will want to remotely access your computer to help diagnose your computer problems. The rest of the story resembles the telephone scam with the ‘technician’ sifting through your machine then asking for some form of payment. This can vary and I’ve heard of fees ranging from £50 – £300 depending on how much ‘help’ they think you need! If you don’t pay and cut the connection they will still have had access to your system, possibly loaded some troublesome software and more than likely adjusted some settings so that it starts to behave erratically. They’re then likely to call you back to tell you it can all be fixed just as long as you part with some cash. Best advice if this message pops is to close any internet browsers that are open, shut down the machine (use Ctrl+alt+del if necessary) and when you restart it run a virus scanner that will detect low level malware. Do not ring the number showing in the message and give me a call if you need reassurance and more help. The other scam involves a free telephone number which also seems to be from a credible source. Let’s say you’re having some issues with your anti-virus program McAfee and you want to talk to their support department for assistance. You search for their telephone number online using Google and inevitably find a selection of websites to choose from. Be very careful which one you pick. Within the list will be bogus companies claiming to provide McAfee technical support with a free telephone number and if you call they are extremely helpful, will want to remotely connect to your computer and then try to charge an extortionate fee for any mock assistance they’ve supplied. Of course, it goes without saying that the actual McAfee site and other real IT support businesses will also show up on the search list and provide a genuine service with reasonable fees. To find contact information for any application you’ve purchased, particularly those that provide on-going assistance, you should be able to open the program itself and use the help or support link to take you directly to their official website. Don’t be put off looking for help online though, a little research can easily establish whether a business is legitimate and if you need help or advice with any computer issue you can contact me on 01452 506529 or send me a message via the form on my contact page.